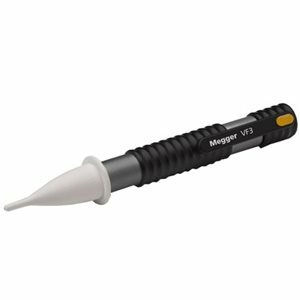 The Megger VF3 Voltage detector is a compact pen-style instrument to identify the presence of live AC voltages from 90 V to 600 V at 50 or 60 Hz. Voltage is capacitively detected, signalled on the VF3 by the illumination of a bright red LED situated within the white nylon tip. The VF3 has the additional feature of an audible warning device actuated simultaneously to the red LED. The VF3 incorporates a torch. Extended battery life is achieved by the use of a bright-white LED.